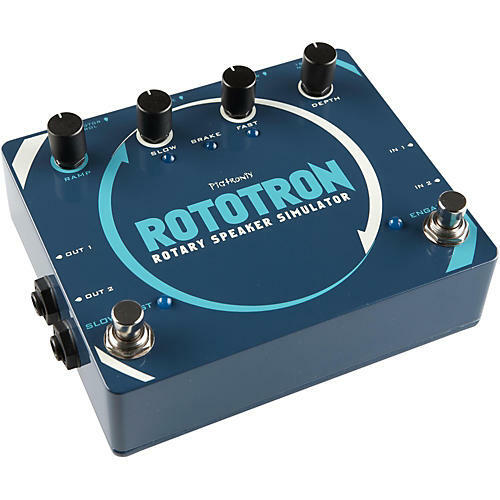 Pigtronix Rototron is an all-analog rotary speaker effect that combines frequency modulation, phase shifting, tremolo, bucket brigade-based chorusing and a three-way crossover all meticulously voiced to achieve unsurpassed, three-dimensional rotary realism in a compact, easy to use pedal. Designed by Howard Davis and David Koltai, the Pigtronix Rototron accurately recreates the complex acoustic phenomenon of the legendary dual rotor 122 and 147 cabinets as used by Peter Frampton, Danny Gatton, the Beatles and many more. The analog design approach used within the Rototron sounds warmer, fatter and feels far more realistic than the digital rotary effects currently available from other companies. Line-level headroom and full stereo input and output options make the Rototron ideally suited to keyboardists as well as guitarists who use a stereo setup live or in studio. Independent Slow and Fast speed controls with adjustable ramp time allows musicians to achieve the mesmerizing sound of speeding up and slowing down an actual rotary cabinet. A remotely switchable Brake option completes the authentic experience to provide rotary bliss on stage without the back breaking hassle. Separate expression pedal jacks for the low and high rotors enable some entirely new variations on the classic rotary sound. Internally switchable input summing and mid-range panning options round out this incredibly flexible, easy to use and hypnotic sounding analog rotary simulator from Pigtronix.